I read a lot. Like an average of one or two novels each week, more if I’m not in school or working on special projects. And I don’t want to own each book I read–in fact, I want to read many more books than I intend to own. Years ago, the library allowed me to do that most easily in the form of printed books I could borrow. More recently, I’ve been checking out ebooks from my library and reading these on the Kindle, which I love. I am also a frequent borrower of books that are part of the Kindle Lending Library (only one book per month though, which usually isn’t enough). So I still find myself wanting more, more, more books. 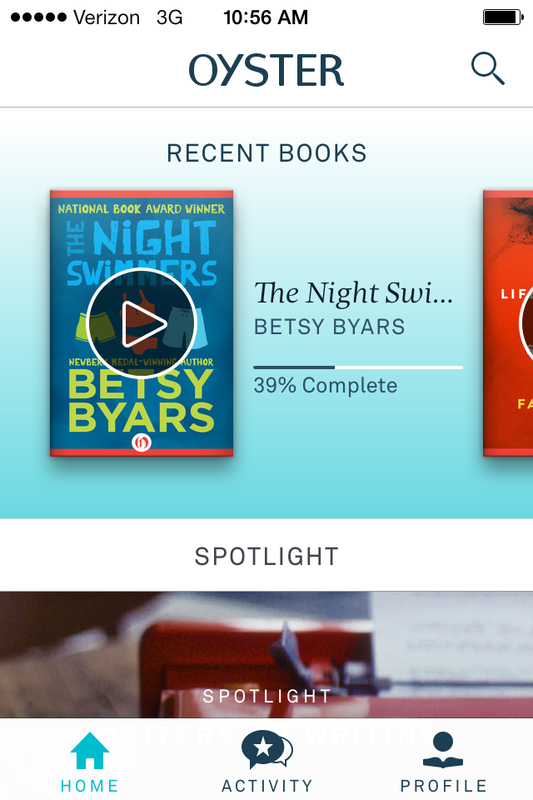 When I first found out about Oyster, the first “Netflix for Books” service, I knew I’d want to try it out. I was one of the first subscribers, because $9.99 per month to read anything and everything in their catalog seemed like a pretty good deal to me. They are focused only on mobile offerings (right now, just for iOS) and therefore don’t have Kindle or other e-reader integration. 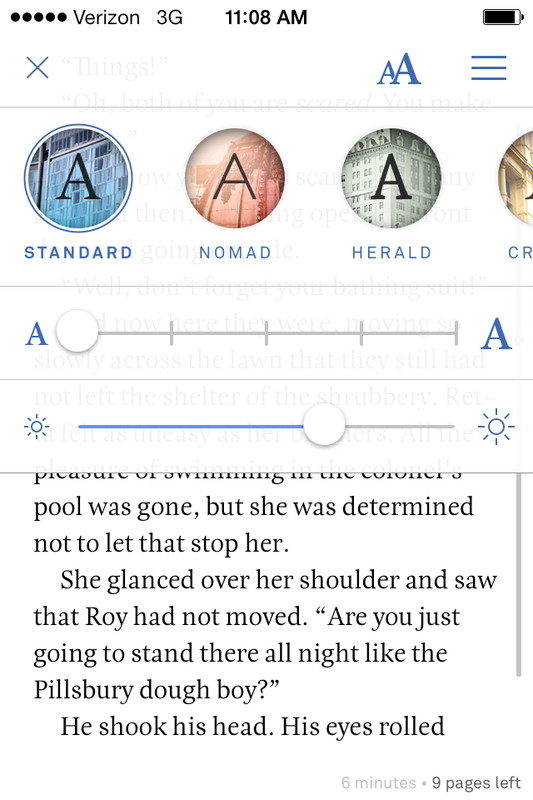 Oyster shows you the most recent books you’ve accessed on its main mobile screen. After signing up and entering credit card information on their website, it’s a simple process to download the Oyster app and log in. The company has more than 100,000 titles and claims to be adding new ones regularly. Oyster doesn’t offer many brand-new releases. Instead, the company seems to have the best subscription-based backlist of traditionally-published authors available anywhere, including books in all genres. I’ve browsed and read parts of several books on Oyster, but have completed (read from start to finish on Oyster) only four. So the built-in recommendation engine isn’t helping me find many books yet. To address this, the programmers could allow customers a way to rate books they’ve already read (similar to the way Goodreads does when you join). However, if you already know what to search for, it’s easy to find books you like on the service. For instance, I remember how delighted I was when I discovered that many of the authors published by Open Road Integrated Media are included in Oyster’s vast catalog. I visited the ORIM Author page to browse through writers I already know about, then searched for them on Oyster to find their books. In this way I found that Ruth Rendell and Donald Westlake have several of the titles from their backlists on Oyster–it’ll take me quite a while to mow through all their books I haven’t yet read. Oyster talks a lot about the social aspect of reading through their service, but so far none of my 300+ Facebook friends or 1000+ Twitter buddies are using it, so I’m still finding that Goodreads is a better place to share and read book reviews. Choosing reading themes is easy. The reading interface and appearance while using Oyster is nice. There are several themes to choose from, and while I initially liked the Crosby theme best because of its sepia tone hues, I ultimately switched to Standard because its white background doesn’t reveal white boxes around imported graphics in books. You can easily increase or decrease font size to suit you, as well as adjust the brightness. One thing I find annoying is the fact that it’s only possible to search the Oyster catalog through the mobile app. I wish I could search for books while I visit their website on a desktop computer. When browsing books on their website, I can add an interesting title to my own reading list, but full search capability there would be a nice added feature. Another small beef is the fact that there is no landscape mode, on either the iPhone or the iPad. I admit it isn’t a big loss on the iPhone’s tiny screen; but when turning the iPad on its side, instead of the expected two page or two column layout, the Oyster app centers the text in a single (and fairly narrow) column in the middle. This is clunky and would be a welcome fix in the next update. As long as the Oyster team keeps adding new stuff for me to read, I’ll be a happy subscriber for life. You should try it out too–coinciding with their iPad launch a few weeks ago, now anyone can give it a test spin for one month, free. A while back, Carisa over at Digital Storytime asked me to guest blog for her at The Digital Media Diet. I finally came through, and she posted it today! It’s a look at what I’ve been working on lately, and why. I’d be honored if you’d check it out and let me know what you think. As long as I can remember, I’ve had the dream of one day owning a house big enough to hold a room with a dedicated library of all my books, complete with one of those rolling ladders to allow me to reach the high shelves. This dream personal library has a velvet chaise lounge with a beautiful bronze floor lamp next to it, and a fireplace, bear rug, the whole luxurious nine yards. I made a startling realization the other day: if we abandon the fantasy of the chaise lounge/floor lamp/fireplace, I’ve already got the dream library, since I have more than 600 books in my Amazon Kindle Cloud Drive and more than 200 iOS apps, half of them book apps. While I don’t really care if these folks hold on to their dead tree books as long as they like, I think they’ll eventually change their minds. Here’s why. Between all my gadgets (Android phone, two iOS devices and a Kindle Touch) I have access to hundreds of books (many obtained free, or at discount prices) in my favorite genres. I send cookbooks, craft books and other how-to or multimedia books to the Kindle Reader on my iPad; mysteries, business books, chick lit and other text-based books I want to read soon to the Kindle Touch, and the rest (books I may want to read someday) to the Kindle Cloud Reader, which effectively stores them in the cloud for free. I use the Kindle Reader on my phone when I don’t have access to one of my other reading devices and I’m unexpectedly caught with an extra few minutes in my day. I like having my library accessible anytime, anywhere–I don’t have to be on the velvet chaise lounge after all. Page turns are managed with a single touch to the right-hand side of the screen, and I can get to any place in the book easily, within a couple of touches. I love the ability to touch a word I don’t know and get the definition instantly. I love that the Kindle system keeps my place no matter which device I’m using. I also love the way many of the book apps I have for my kids not only hold their interest but encourage literacy and retention through interactive features (one company that does this especially well is Oceanhouse Media with word highlighting and the ability to hear a word aloud when it’s pressed in their storybook apps). I’ve been reading the Song of Ice and Fire series by George R. R. Martin. Because I am a cheapskate, I decided to read the third book (A Clash of Swords) in paperback, since I found it at my local used bookstore and purchased it with store credit. This book, in mass market paperback form, is heavier and bulkier than my Kindle Touch and won’t stay open without my propping it with a heavy object, so it’s difficult to hold with just one hand. I like the fact that I can store all the ebook versions of the others in the series (and hundreds of other books) on a single device that weighs less than the small-format paperback. Lately when I hold a print book, especially a hardcover, I’m hit with the overwhelming feeling of wastefulness. There’s something pretty unpleasant about the fact that the book I hold in my hands is a real, tangible slice of what used to be a living thing, processed and assembled for the sole purpose of my entertainment or learning. I offset this as much as I can by taking physical books I don’t want anymore to my local used bookstore, then offering the ones they don’t want on PaperbackSwap.com, but the fact is: printed books use up resources (paper, ink, glue and more) that no longer need to be expended for the same entertainment or educational value. Non-fiction books in print form eventually become outdated. Information changes and evolves as humans gain more knowledge about a topic, or when materials or ways of doing things are improved. But let’s be honest: most non-fiction print books will be truly useful for only a fraction of their lives. After that, the next edition replaces it–at significant cost. Textbook publishers have profited from this with great success for many years–at the expense of both teachers and students. It’s time for ebooks to become the preferred way to distribute educational materials and other non-fiction content, which can be updated quickly and redistributed almost instantly, to all users of the material, with no expending of the tangible resources needed to print a new edition. The Kindle ‘Farthest Page Read’ Feature Needs a Reset Button. The ability of Amazon’s Kindle devices to keep my place is great, but occasionally I accidentally make my way to a later page that doesn’t actually reflect where I am in the book. When this happens, keeping my place manually becomes a pain in the neck. I’d love to see a way to reset this, but I imagine it won’t happen, since the addition of this feature would make it much easier for spouses and other family members to share books on the same family of devices. But since I let my kids and spouse share my print books, I’d sort of like to share my ebooks with them too, in a hassle-free way. Come on, Amazon! Prices of Ebooks from the Big Publishers are Too Expensive. Books coming from the big 6 publishers are priced according to their artificial and rapidly-crumbling world of print scarcity and their hardback-to-trade-paperback-to-mass-market-paperback release schedule. This is archaic and needs to change. Why should the ebook version of a title ever cost more than the mass market paperback would? It all comes down to greed, and an over-reliance of the old way of doing things. Eventually these outdated practices will put many of these publishers and retailers (remember Borders?) out of business. Ebook Lending Needs to Be Improved. It’s nice that I can lend one of my Kindle books to someone else (if the publisher allows it), but I can only do it once. After that, the book can’t be lent again. I don’t mind the restrictions of one-person-at-a-time and my own inaccessibility during the lending period (since these are in force for my print books too) but let’s remove the artificial restriction of once only, and let me lend a book I’m finished with over and over if I choose. Ebook Devices Aren’t Durable or Affordable Enough. When iOS devices and other ebook readers are able to withstand normal wear and tear by school-aged children (i.e. being dropped on the floor) and are cheaper than $50, we will see a true revolution. Until then, they aren’t practical enough to replace most of the printed books in my house, which are now children’s books. Plus an entire segment of the population (the lower middle classes and below) have little to no access yet. So, what I’m saying is: in spite of the drawbacks, ebooks have become just as ‘real’ to me as print books are. I love them both, but I’m not buying many print books anymore. And eventually (probably within the next five years or so) most of the rest of you will be saying the same thing.